Essential oils are being used as skin care product from the very ancient time. The secret of beauty queen Cleopatra’s beauty was nothing but various essentials oil. Essential oils solve different skin problems and make your skin more beautiful. For this reason nowadays essential oils are being used in different types of skin care products of reputed brands. They cure acne, blemishes, pigmentation, prevent wrinkles and enhance the glow of the skin. But before you use essential oils, you must know the use of it. Essential oils are highly concentrated things. It is better not to use them raw on your skin. It may damage you. So dilute your essential oil either in water or in carrier or base oil to reduce its strength and to avoid the adverse effect on skin. This article will make your inform about the different types of essential oil and its uses. Sandalwood oil perhaps is the most widely used essential oil. It solves various types of skin problems and side by side it also enhances the brightness of the skin. Antibacterial, antifungal and antiseptic property of sandalwood essential oil cures acne, pimples, blackheads, white heads and other skin problems like magic. It also has antiaging property which rejuvenates dull and dry skin. Regular use of sandalwood oil brightens your skin and makes it very soft. The use of sandalwood essential oil is very easy. Mix sandalwood oil with water in 1: 10 ratio. Mix well and massage that oil on your skin daily. You will notice a brighter skin within few days. Sandalwood essential oil is extracted from sandalwood. Lavender essential oil is being used to solve the various skin problems from times immemorial. Like sandalwood oil, lavender oil also has antiseptic and antifungal properties which help to cure various skin problems like sun burn, blemishes, acne scars, hot rashes, etc. Massage lavender oil on your skin to overcome these skin problems and to get a brighter skin enhancing the natural glow of it. But before using the lavender oil, you have to mix it in either base oil or in water. Take ½ cup warm water and add 5-6 drops lavender oil in it. Massage it on your skin. Or you can mix this lavender oil with coconut oil, pine oil or chamomile oil. Jasmine essential oil is extracted from the flowers. It has a pleasing and sweet smell which uplifts your mood. Antiseptic quality of jasmine also cures acne scars and other fungal infections very effectively.Regular massage of jasmine oil brightens your skin and makes it flawless. Mix jasmine oil in pure water before massaging it on your skin. Jasmine oil also blends well in orange juice, watermelon juice, green coconut water, etc. Lemon essential oil is produced from the skins of the lemon through the vapor distillation process. It helps to rejuvenate dull skin. Regular use of lemon oil on your skin helps to lighten the complexion of the skin and protects your skin from various problems.Lemon oil is acidic in nature and that’s why it may create skin irritation. Mix not more than 4-5 drops of lemon essential oil in a tablespoon of water or other carrier oil to use it on skin. Lemon oil rejuvenates dull skin and brightens it. Rose essential oil is another necessary essential oil which is derived from rose petals. Rose essential oil not only has beautiful fragrance, it also strengthens gums, tones and lifts skins. It prevents and cures wrinkles of the skin and cures loss of firmness of skin and muscles. But like other essential oils you need to dilute it too.Rose oil blends and works well in chilled milk. Take a cup of chilled milk and add 10 drops of rose water in it. Mix well. Massage this oil on all over your body everyday. It helps to enhance the brightness of the skin and makes your skin petal soft. Another excellent essential oil for skin is Galbanum essential oil. Thousands of years ago it was used by Greek to cure acne and to improve the texture of the skin. Mix few drops of galbanum essential oil in any carrier oil and rub it on your skin. Within few days you will notice the enhanced brightness of the skin. 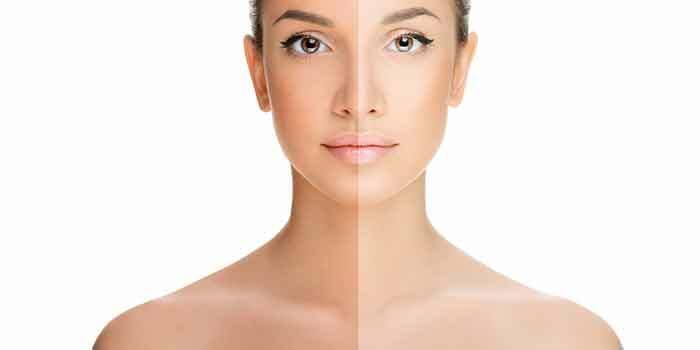 To enhance the brightness of the skin there is no need to go to the beauty salon and spend a good amount of money there which may create some extra pressure on your pocket. You can do it of your own. Buy some essentials oils and use them according to the tips. Essential oils work excellent in the long run.